Will "The Office" Hire An Unknown to Replace Steve Carell? The Steve Carell victory lap kicks off in earnest on the Thursday night edition of The Office. The episode—which, not coincidentally is the first featuring Will Ferrell—is the first of the final three for Carell, which means it&apos;s time for The Office to get moving on finding his replacement. Many major guest stars (including Ferrell, Will Arnett, Ricky Gervais and Ray Romano) will be appearing between now and the end of the season, but judging from a new interview with executive producer Paul Lieberstein, you shouldn&apos;t get too comfortable with any of them. Said Lieberstein to Vulture: "Now, in the finale, we do have some very big stars for that single episode. But we&apos;re asking people to believe these people are in consideration for a spot that can&apos;t go to an unknown [actor] — or that it&apos;s very unlikely it would go to someone without Steve&apos;s experience. It seems a lot easier to believe James Spader is truly a candidate for the manager position because he&apos;s someone who could easily get that job in the fall. In the real world. It&apos;s a lot to ask in someone to completely suspend their knowledge of how television works. With Spader or Will Arnett or Ray Romano or Catherine Tate, it&apos;s easier to believe this is someone who could be in contention." Translation: Lieberstein wants people to believe that these guests could be the manager on The Office, but that&apos;s not necessarily what will happen. Take his later quote about the daunting task of replacing Carell. "The precise casting has not been finalized. But we know who our stars are: They&apos;re already in the cast." Huh. 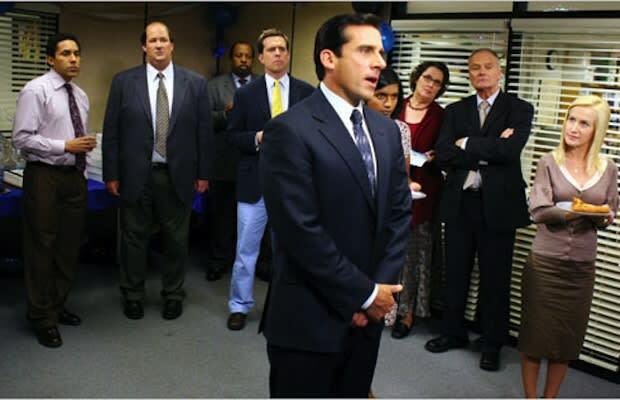 Could The Office replace Steve Carell&apos;s boss with a no-name actor, and shift the focus to the worker bees buzzing around Dunder-Mifflin? We wouldn&apos;t be surprised... and we wouldn&apos;t be disappointed.